Professor Dawson’s recommended roadmap is based on research into past experi­ences in IT modernization at the Federal and State level, as well as in industry. He draws lessons from his research and extensive case interviews with Federal and State Chief Information Officers (CIOs). Using these lessons, the author frames impediments to modernization and risks for agencies that do not modern­ize, including continued cybersecurity weaknesses. 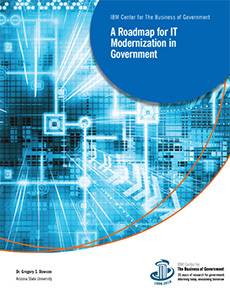 The report uses this framing to develop eight key lessons for government leaders at various stages of IT modern­ization, and concludes by setting out a roadmap for implementation that agencies can adapt to address these key lessons. Seek feedback throughout the process to capture lessons learned and act accordingly. Focus on how technology is supporting mission goals. Identify stakeholders for each step, making leadership and operational staff aware of their requirements and empowering them to act. Ensure check-ins with agency leadership, functional leadership, technical leadership, and key users must take place throughout the process. Blend a strong execution strategy, technical approach and the right team. Provide 360-degree communications to foster knowledge and buy-in. Measurement results both inside and outside the organization. If the government embraces these lessons, agencies can reduce operating costs, lower the risk of cybersecurity attacks, and position themselves to take advantage of new technologies, including cloud, analytics, mobile, and artificial intelligence. The report concludes with a recommendation that government make key investments in IT modernization, identifying and prioritizing the necessary initiatives for maximum effectiveness. Priority investments should be integrated into the budget planning cycle, to provide a founda­tion for continuous innovation and improvement. With recent statutory and agency progress, the federal government is well-positioned to move forward with effective IT modernizations that improve mission performance.